The petition includes declarations by seven former workers who detail widespread misconduct aimed at downplaying the extent of contamination at the shipyard. The former employees say their supervisors participated in fraudulent activity; several say top-level on-site managers directed employees to cheat. One longtime compliance officer points to Tetra Tech’s contract, which he says incentivized the company to cut corners. Some of the workers were laid off or fired; many say it’s because they raised red flags. Ultimately, if what the former workers are describing is true, it means for years, potentially contaminated soil was being shipped across California under the guise that it was clean, and that radioactive soil taken out of the ground likely ended up back at the shipyard without ever being cleaned up. Click here to read the company's full statment. The shipyard, a superfund site, is slated to become parks, offices and condos. For decades starting in the 1940s the Navy ran a Radiological Defense Lab where officials conducted radiation experiments on animals and decontaminated warships exposed to atomic weapons tests. Tetra Tech won hundreds of millions of dollars in Navy contracts to clean up contaminants in the soil. 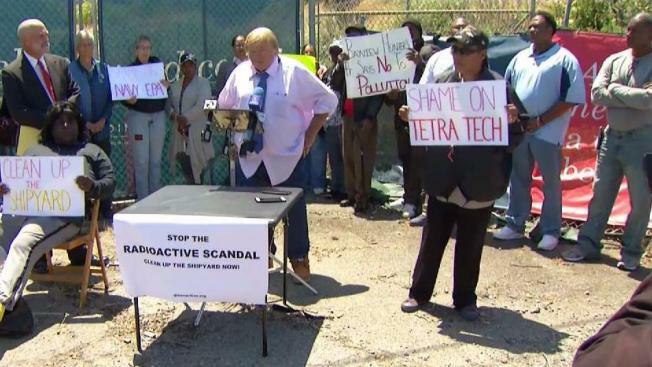 Greenaction wants the NRC to strip Tetra Tech of its license to handle radiological materials and to prevent the company from working on other federal cleanup sites. “The fundamental confidence that the company can be entrusted with this critical work has been irreparably shattered by its intentional fraud,” the organization states in its petition. The NBC Bay Area Investigative Unit exposed in 2014 that the Navy caught Tetra Tech mishandling soil samples and falsifying radiation data. The company investigated and blamed low-level sample collectors for going rogue. The company later cleaned up the areas in question and subjected employees to ethical training. The NRC subsequently launched its own investigation and found that a supervisor and an employee deliberately falsified soil sample records. MacPherson said that investigation “did not conclude that anyone on Tetra Tech’s management team was involved in the misconduct” and said the NRC found Tetra Tech took appropriate actions and found no evidence of any recurrence. But former employees say both investigations were whitewashed, and that the bad behavioral extended beyond just a few employees and a few dozen soil samples. They point to fraud that spanned all facets of the cleanup operation including fake soil sampling that happened across large portions of the shipyard, data that employees manipulated, radioactivity-detection machines that workers tampered with, and soil remediation efforts that employees botched either because of incompetence or a willingness to cut corners. Five former workers say in their declarations that the company hired an unqualified employee – who they say lied about her background on her resume – to lead the critical job of scanning soil for radioactivity in what was known as the “radiological screening yard.” Many employees believe she was chosen to oversee this process because she was romantically involved with a Tetra Tech manager. After soil was collected from across the shipyard, it was spread out on football field-sized pads at the screening yard and scanned with machines for radiation. According to employees, if the soil was found to be clean it would automatically be put back into the ground. If the soil was found to be contaminated, it would be remediated and then put back into the ground. Former workers say the woman in charge botched the detection effort. Bert Bowers, the project’s radiation safety officer, said thousands of cubic yards of questionable soil may have gone back into the ground. “I am concerned that there may be large amounts of soil used as back-fill at Hunters Point that…continues to have radiological contamination that poses a health hazard,” he states in his declaration. Bowers first spoke with NBC Bay Area in 2014 about ways managers sped up production to finish work as fast as possible. He believes the alleged cheating was motivated by profit, pointing to Tetra Tech’s “fixed-price contract.” He says the less time and resources the company spent on testing and cleaning up contaminated soil, the more money Tetra Tech would make. In his declaration, Bowers said as far back as 2006 company supervisors tweaked a device – a conveyor belt system – to run faster and detect less radiation, allowing for more material to leave the site without having to be cleaned up. Employees say the conveyor belt system was eventually shut down when workers raised red flags about possible cheating. They then say the company developed a new way to detect radiation using a machine called a portal monitor, which some former workers also questioned. Susan Andrews, a radiation control technician, told NBC Bay Area that supervisors lowered the sensitivity of the portal monitors in 2011. She says that resulted in truckloads of potentially radioactive-contaminated soil being allowed to leave the shipyard as if it was clean. Anthony Smith, another whistleblower, told NBC Bay Area that starting in 2009 supervisors ordered him to replace potentially contaminated soil samples with clean ones and forced him to sign falsified documents that were later submitted to the government. He pointed out to NBC Bay Area specific areas where he says the cheating happened. It was Smith’s interview with NBC Bay Area that got the attention of state and federal officials. In September regulators agreed to put a hold on further land transfers from the Navy to the City of San Francisco until it can be proven that the shipyard is clean and safe for public use. Late last year, the Navy’s Base Realignment and Closure office, which is in charge of remediating contaminated naval bases for redevelopment, launched an investigation into Tetra Tech’s previous work at Hunters Point. Greenaction hopes the new written testimony from former workers will keep the pressure on the Navy to fully investigate the scope of the alleged fraud by Tetra Tech – and force the NRC to take swift action. According to the NRC’s website, the commission has 120 days to issue proposed decisions to grant or deny petitions. If you have a tip about Hunters Point, email Liz Wagner at elizabeth.wagner@nbcuni.com or follow her on Facebook and Twitter. If you have a new story for the Investigative Unit, email theunit@nbcbayarea.com or call 888-996-TIPS.